While the NASB translates this term to yearn, other translations choose the word faint. This word that describes the poet's reaction towards the thought of The Lord's courts in the Hebrew is fascinating. The original word is usually translated complete. So how does one get faint from complete? There is one word that describes the use of faint instead of complete: Thanksgiving. That time when everyone gets together and that table is piled high with all sorts of good things to eat. There's an oversized bird, mashed potatoes, sweet potato casserole, green bean casserole, corn souffle, macaroni and cheese, cranberry sauce, stuffing/dressing, white bread, corn bread, ham, lechon, rice, beans, moros, platanos, yucca... (maybe only in my home-town). There's so much food and somebody's got to eat it! So we indulge. We have seconds and fourths then comes the dessert (___ Pie, fill in the blanks)! We eat until we are satisfied. We eat until we are full. All words related to complete. Then we take our naps. We eat until we faint. Satisfaction/completion has always been tied to the idea of rest. Consume until you collapse. So it should be with our view of God. Our impression of His loveliness should be so huge that the minor glimpses we are permitted to see leave us in a tryptophan-like coma. It is a problem to have a small view of God. A small view of God leads us to some pretty skewed versions of His Person (usually of the selfish variety). He is immense. He is awesome. The moment you begin to think that you understand the person of Jehovah coincides exactly with the moment you have no clue about Him. This fact should pique our interest to learn more about Him while realizing that we will never become experts. We, as Christians, should be OK with that reality. We should continue to seek our fill of Him. From Verse 1 - "How lovely are your dwelling places..."
Through creation, we know that God is a creator of lovely things. He is majestic and loves beauty. Romans 1 is the popular passage when referring to God's greatness revealed in creation and those concepts certainly apply here. One can look to the heavens and the earth as a testament to God's power and glory. I have had the privilege of driving back and forth through the Big Cypress National Preserve for the past few months and I can personally attest to the beauty of nature as a reflection of God's own beauty. Whether discussing the sunset on the horizon or an osprey taking a catch to her nest, the majesty of the Almighty is on display. From Verse 2 - "My soul longed...for you"
Beauty and the Beast - In this tale, a beautiful woman kisses a horrible beast and thereby transforms this monster into a man. Didn't Christ come into this world to "kiss us" with His grace and transform us into godly creatures? This is an inward reality that occurs the moment one believes on the Lord Jesus Christ. The Man in the Mask - In this tale, a man with a horribly disfigured, ugly face is forced to wear a mask as a public service. However, he finds that the mask is actually improving his looks little by little until he no longer needs the mask to cover his ugliness. In a sense, this also occurs in the life of a believer as we become more and more conformed to the image of the Son of God. We daily take up our cross and follow after Christ. We make daily decisions to serve Him and confess our shortcomings. This is not magic. It takes discipline. That's why we are called disciples. The outward reality comes little by little, day by day, hour by hour. From Verse 2 - "My heart and flesh sing for joy..."
The heart, in the Old Testament, is where emotions were turned into decisions — it was the rational center of a person's being. The flesh is usually the opposite, it is the naturally selfish inclination of man as a creature. Wouldn't it be nice for our rational minds and primal instincts to find agreement? Wouldn't it be nice to see the civil war between flesh and sense in Romans 7 come to an end? It does! If only for a fleeting moment, these two currently opposed elements find harmony when we are immersed in the presence of the Alighty. Is this where you want to be? 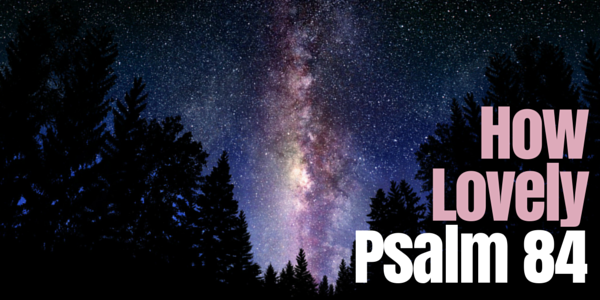 Was your heart stirring at the thought of absorbing God's glory in His very presence? When we ask to see His face He will reveal Himself. He may, like with Moses, reveal only the fraction of His glory that will overwhelm us while protecting us. But He will respond. As always, seek and ye shall find.